This April members of Historic New England’s Appleton Circle traveled south to Richmond, Virginia, with President and CEO Carl Nold for a four-day excursion to the historic city. The capital of Virginia, Richmond is rich in American history, from the earliest days of English colonies, to its influential role leading up to the Revolutionary War, and to the Civil War when it served as the capital of the Confederacy. The group met with Alex Nyerges, director of the newly expanded Virginia Museum of Fine Arts, and visited the museum’s beautiful exhibitions, including the Fabergé collection and the Art Nouveau and Art Deco collection. Members also spent a day visiting two plantation homes in Charles City by the James River. Located about twenty-five miles southeast of downtown Richmond, these establishments are some of the earliest successful settlements after Jamestown. 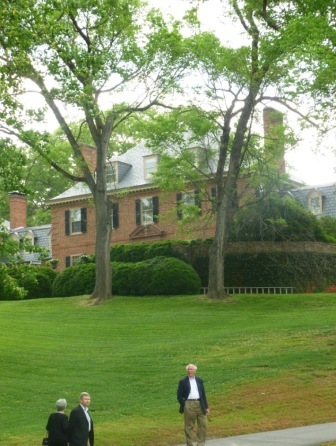 Appleton Circle members enjoyed private receptions at the homes of Richmond collectors and a private estate on the National Register of Historic Places. The travelers stayed in the iconic and historic Jefferson Hotel, built in 1895 by Richmond benefactor Major Lewis Ginter. 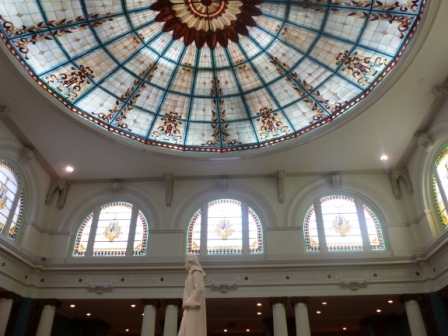 The New York firm Carrère and Hastings designed the Beaux Arts-style hotel, complete with a statue of Thomas Jefferson by Edward Valentine under the stained-glass domed skylight of Tiffany glass. Learn more about Historic New England’s Appleton Circle membership.